Another trip down the chocolate aisle has produced two new contenders. 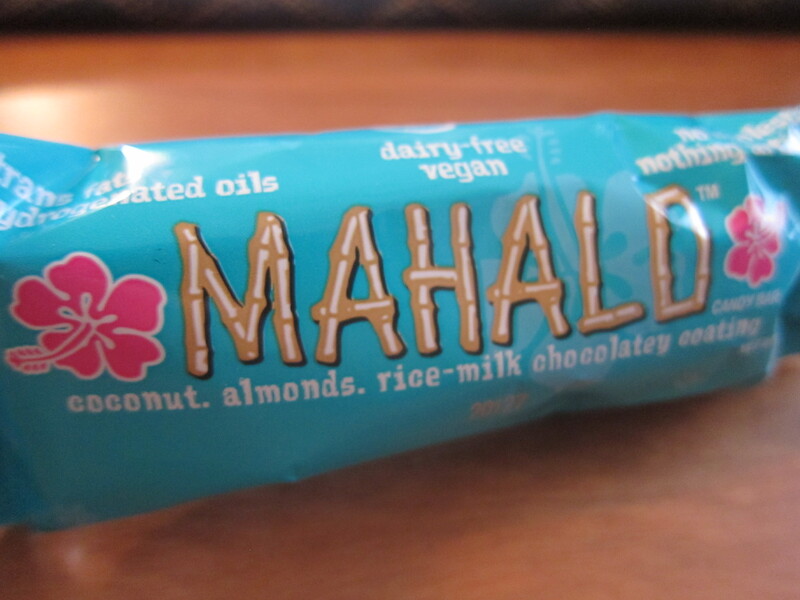 I’ll jump right in, starting with the Mahalo bar made by Go Max Go. 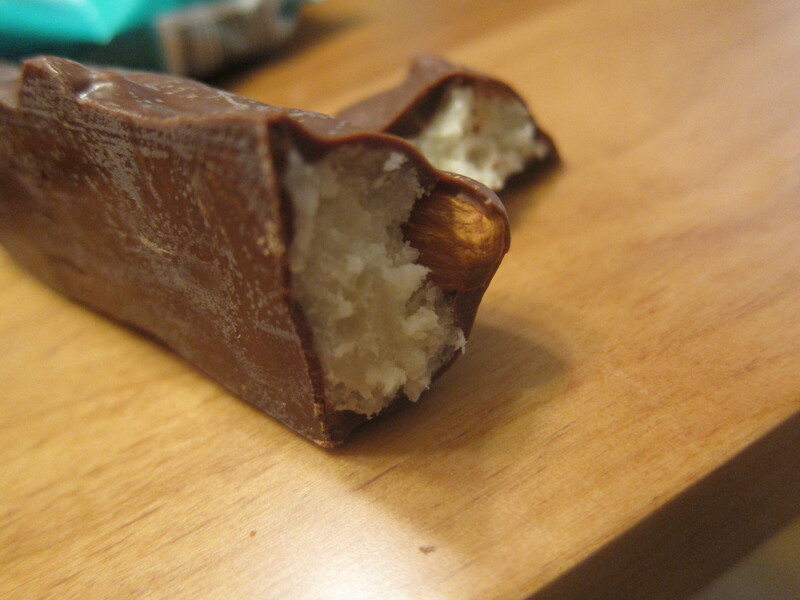 This is like a vegan almond joy, with smooth milk chocolate coating the sweet, dense coconut interspersed with almonds. The Mahalo is a definite success, with the chocolate tasting milky and the whole thing not being too sweet but still giving you that candy bar high. A tasty and satisfying find for $3. 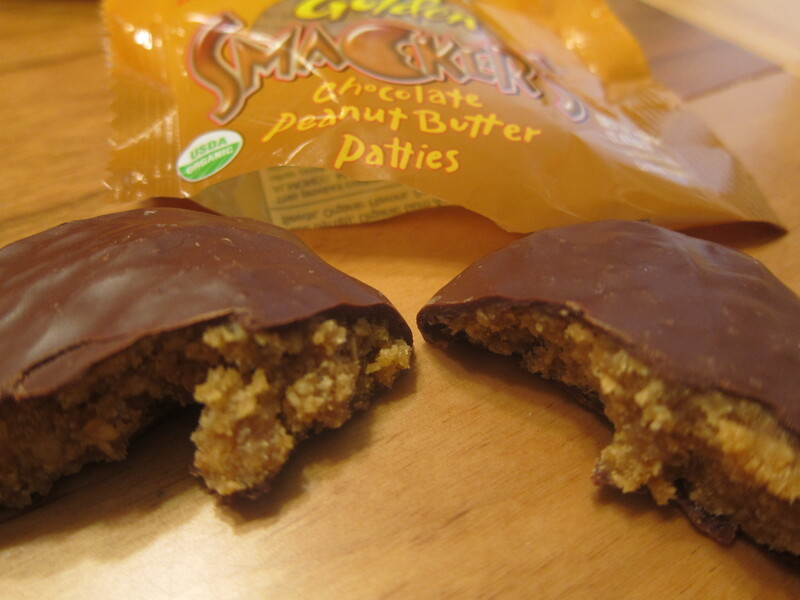 Next up are the Golden Smackers peanut butter patties, I had high hopes for these. They taste okay at first. The chocolate is not bad, the peanut flavor is fairly low but then there’s this odd bitter aftertaste. I’m not sure if I got a bad batch, sometimes sesame can taste that way. I would probably not get these again but I’d be willing to give it another try if they were sampling them. PS: While we’re on the topic, these homemade almond joy bites from tasty-yummies look delicious if you’re in the mood to make some. If you and I have anything in common, then I think it might be my love of wandering through grocery stores. And when it comes to gourmet chocolates, I always wonder if they are as delicious behind their beautiful wrappings? Please, I think each time, let this be amazing. 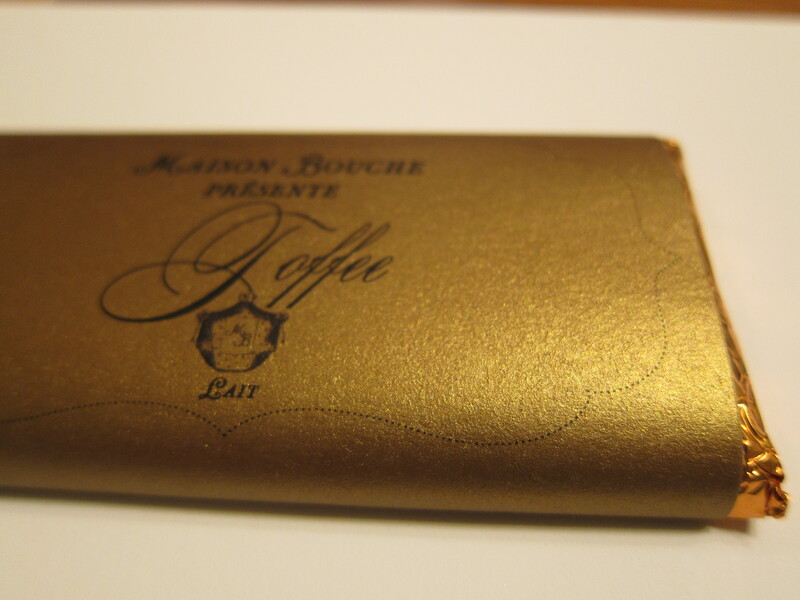 Maison Bouche is a very lovely looking chocolate, clearly French inspired, that comes in gold foil and fancy paper. 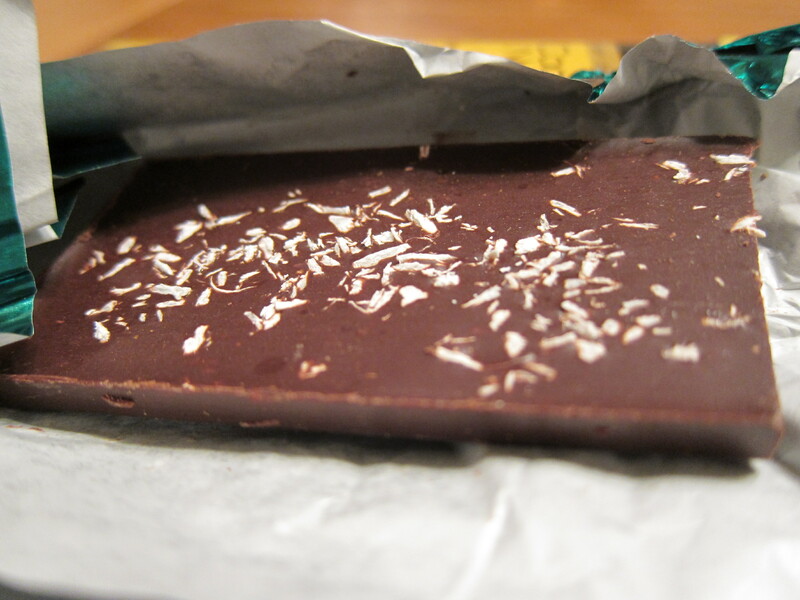 It comes at a steep price of $8 a bar in stores like Whole Foods. Is it worth it? 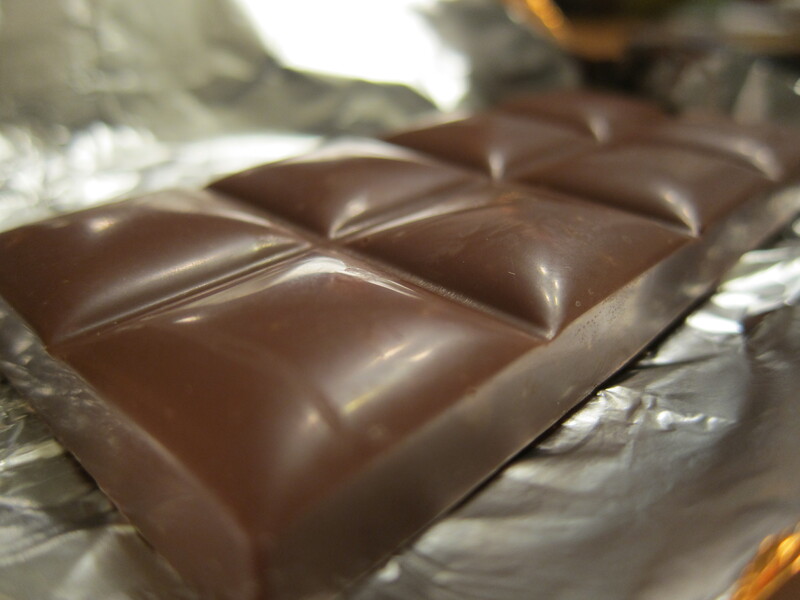 It was not my favorite chocolate, being rather sweet, which is not something most Americans mind. It tasted very sweet and slightly silky, with tiny pieces of crunchy toffee. It is milky but not as much as Cadbury’s from the UK (not the fake Cadbury’s here in the US). It would make a great gift for a sweet tooth, being so pretty. 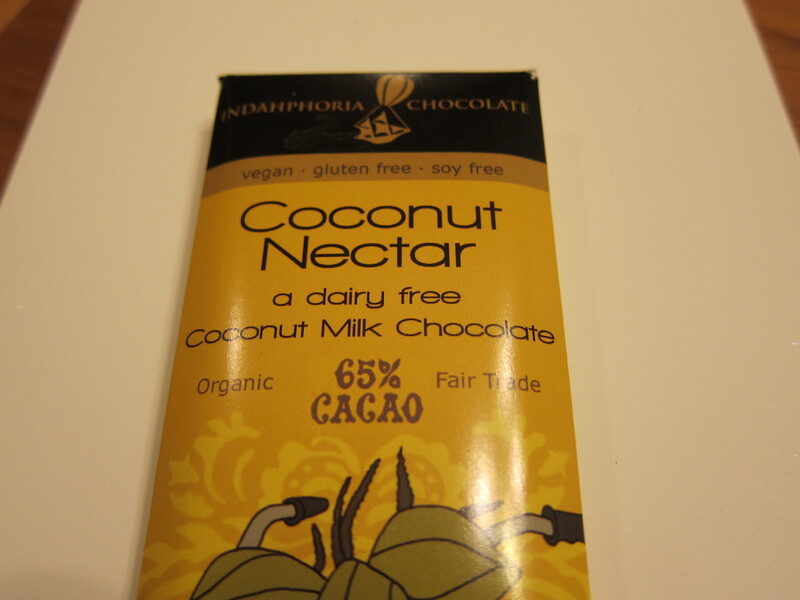 Next up we go to the opposite end of the spectrum, a vegan chocolate made with coconut milk. Does it taste like chocolate or more ‘earthy’? It is a mere $3.25 by comparison and comes in a slim container with lovely dark green foil. I’m happy to report that this was a bit more to my liking, with a complex dark flavor and bright flakes of coconut. It is not too sweet and would probably not satisfy a typical chocolate lover, but would be great for vegetarians, vegans or people who like more complex desserts. For some reason I don’t like drinking plain water, but during the summer I definitely need more water. At a charity event, I discovered a delicious drink featuring lemonade + gin + rosemary. 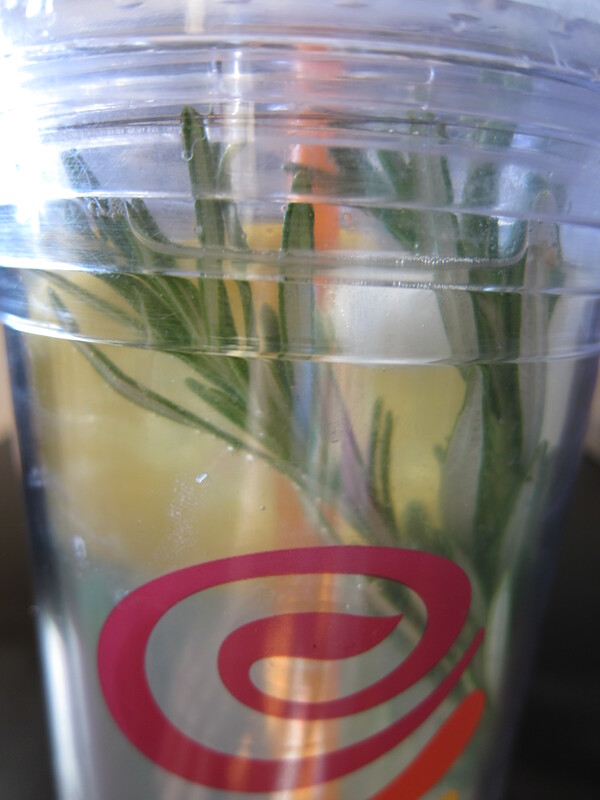 I adapted this to make a rosemary lemon water, but you can also use mint, other herbs or no herbs. This is a lemony flavored water, if you want real lemonade then use 3 lemons and 3 tablespoons of syrup. I’m always hesitant to tell people when my baked goods are vegan, because they tend to shy away. But I’ve made these cupcakes a few times now and they are fabulous. They’ll stand up to any cupcake, vegan or otherwise. The cupcake recipe comes from the Babycakes book and was shared via Gwyneth Paltrow’s site, http://goop.com/newsletter/49/en/. I didn’t use their frosting recipe, but instead did one more like a traditional buttercream frosting sans butter. Preheat the oven to 325°F. Line one, standard 12-cup muffin tin with paper liners and set aside. In a medium bowl, whisk together the flour, potato starch, cocoa powder, arrowroot, baking powder, baking soda, xanthan gum, and salt. Add the oil, agave nectar, applesauce, vanilla, and hot water directly to the dry ingredients. Stir until the batter is smooth. Pour 1/3 cup of the batter into each prepared cup. This portion will almost fill the cup up entirely. Bake the cupcakes on the center rack for 22 minutes, rotating the tray 180 degrees after 15 minutes. The cupcakes will bounce back when pressed and a toothpick inserted in the center will come out clean. Remove from the oven. Let the cupcakes stand for 20 minutes. Transfer them to a wire rack right side up and cool completely. Mix all the ingredients together with a spoon or in a mixer. 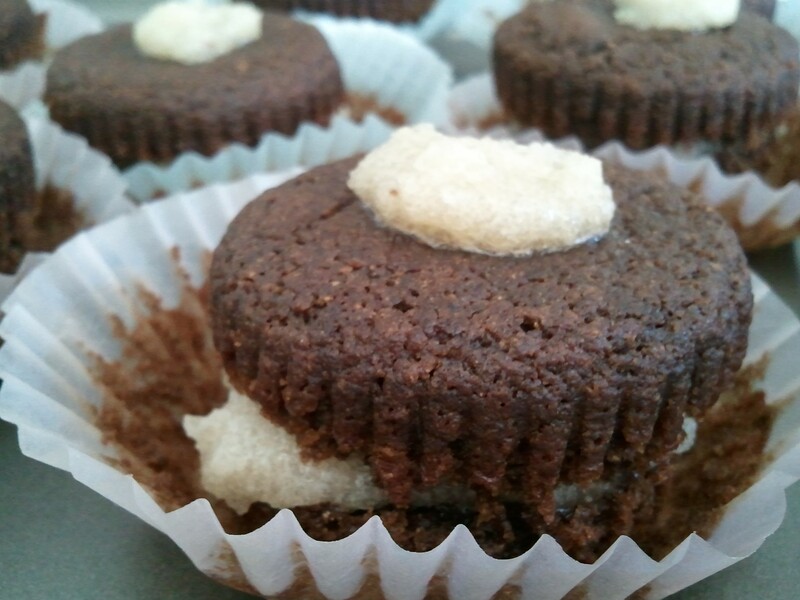 When the cupcakes are cool, slice the top off and spread frosting in the middle. This allows for easier eating but does require you to open the cupcake holders slightly. It’s summer time once again, and that means all the fruit is here. I’m a big fan of quickly pulled together cobblers for dessert now that I can no longer have eggs or cow’s milk. 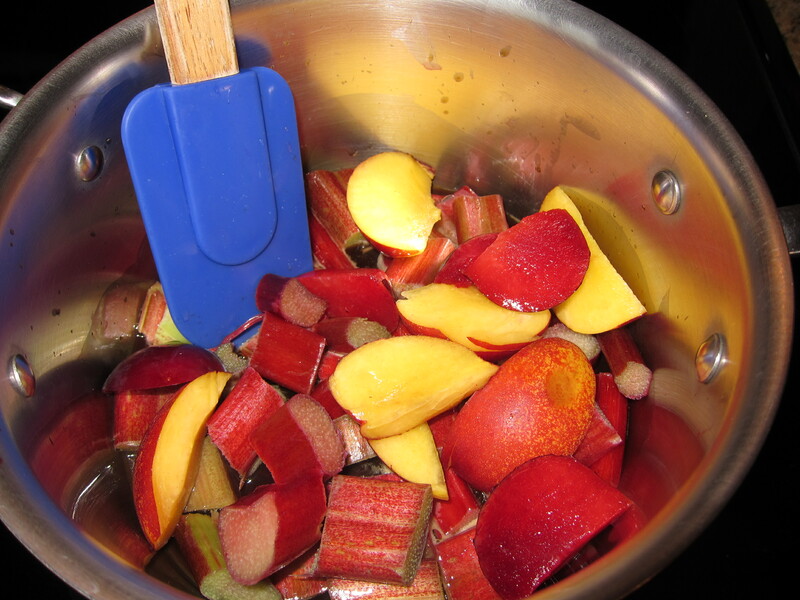 I love combining rhubarb with nectarines or peaches, which are less sweet and traditional than strawberries. You can eat the poached fruit directly, use it in oatmeal or put a very thin pastry of flour, oats, butter and sugar on top and bake for 25-30 minutes in a 350 degree oven. 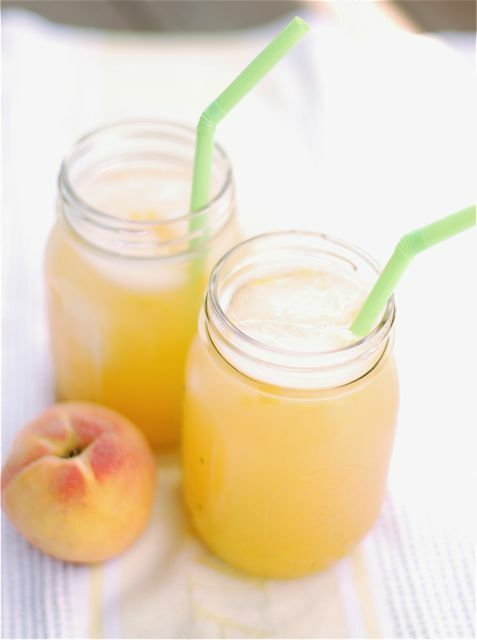 Strain the remaining liquid and set aside to mix in drinks, yogurt, etc. I must admit that it’s difficult to do step #7. I end up drinking it straight.